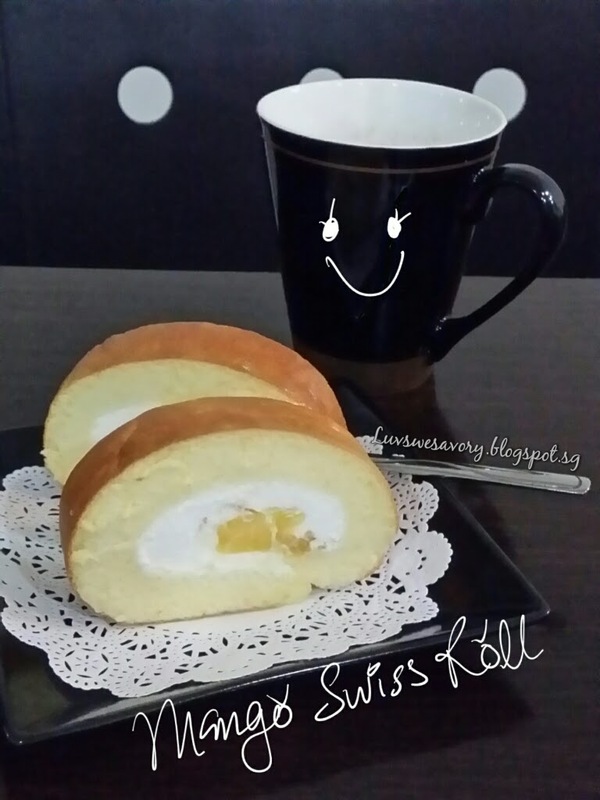 Made a simple swiss roll with fresh diced mangoes in the filling. Happy no crack when rolled. ... hee .. hee ! Yes, very nice sponge roll. 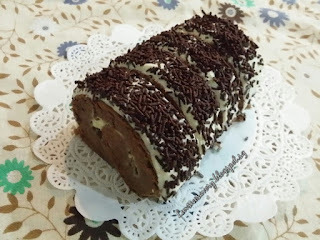 Since my big kids wouldn't say no to any swiss rolls, I used the same recipe to make a vanilla mango swiss roll. Below my slightly modified version as baked a vanilla sponge roll cake. 1) Sift the flour and set aside. You will need a baking sheet/tray 25cm x 25cm size, line with parchment paper. 2) Separate the eggs into yolks and whites. 3) In a clean mixing bowl, whisk the cold egg whites and cream of tartar till foamy using the electric mixer. Gradually add in caster sugar in 3 separate additions and beat till stiff peak, formed into a firm meringue. Transfer to a big bowl and chill in the fridge. 4) In the same mixing bowl, cream egg yolks about 2 - 3 minutes. Add oil, milk and vanilla extract and continue beating till it incorporated. 5) Add the sifted flour and mix until just combined. 6) Gently fold 1/3 of the meringue into the batter with a spatula. Fold the remaining meringue into the batter in 2 batches until it looks evenly mixed (no streaks of meringue). 7) Pour the batter into baking sheet. Gently tap the baking sheet a few times on table top to release the trapped bubbles in the batter. Bake in the oven for about 14 minutes or the top is evenly light browned, and a toothpick inserted into the centre comes out clean. (I used the middle rack. The temperature of the oven may vary, do check, do not over bake the cake as it will be too dry and may crack easily when rolled). 8) Remove the baking sheet from the oven, immediately drop the baking sheet at a height onto a table top. This action helps to keep the springy texture of the sponge when it is left to cool. Leave to cool in the pan for 1 minute. 10) Spread the whipped cream over the sponge leaving about 1/2-inch border all around. This is to prevent the excess cream oozes out when rolling the cake. Top with some diced mangoes. 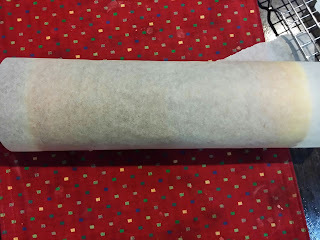 Roll up gently by lifting it up with the parchment paper. 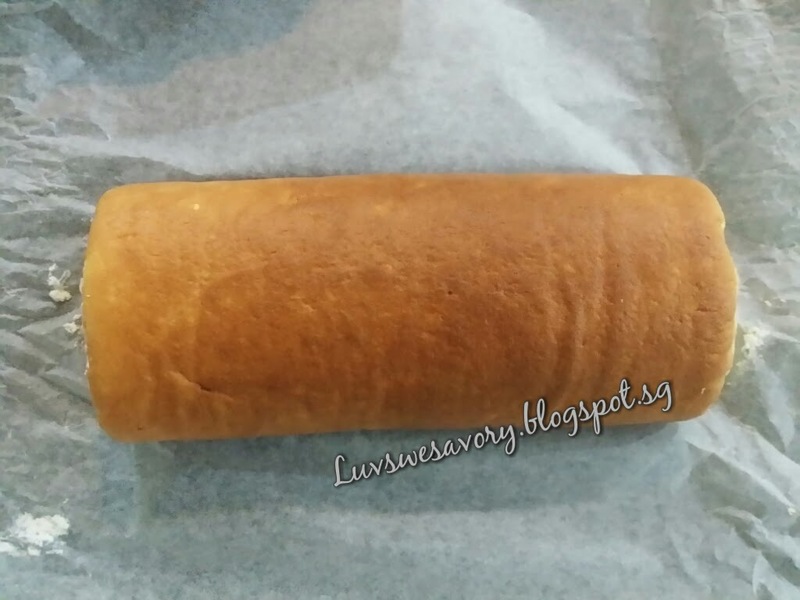 Place the rolled cake seam side down. Wrap with parchment paper and chill in the refrigerator for few hours. (Note: I've prepared the whipped cream in advance of baking and chilled it in the fridge till ready to spread the sponge roll). Karen, the swiss roll is beautifully made, not even a small crack! I can imagine its softness and the taste of mango too..lol! Have a beautiful new week! Thanks Nancy, this sponge roll is soft and yummy. You too have a wonderful week ^-^! 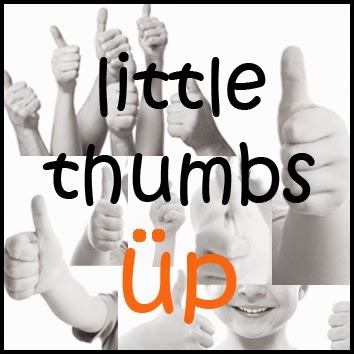 Thumbs up for you, Karen! Thanks for your link up! Hi Jozelyn, thank you for your compliment! This mango swiss roll looks so perfect and delicious! Ha ha ! Caught you ?! Thanks for your compliment ^-^! Wow! Perfect roll. Looks so delicious with mango!